MORNINGLOW DOGS DO HAVE PRETTY FACES, BUT WE ARE NOT JUST SHOW DOGS! Long recognized as a sport for sighthounds, both AKC and UKC have offered titles in lure coursing. Eventually it was discovered that many other breeds of dogs also LOVE to chase a lure, and both venues have developed programs to encourage and award those dogs in non-sighthound breeds that can successfully run the course. For a dog the size of a Coton, the course consists of a 400-yard fenced run, with a plastic bag (the modern-day lure) attached to a wire that is usually run off of a car battery around the edges of the course in various twists and turns. To successfully complete a run, a Coton would need to finish the course within 90 seconds of the start, all while following the trajectory of the lure and maintaining proper focus on it, as determined by an AKC or UKC-approved judge who is up on a ladder, watching the fun. Each completed run earns the dog a ribbon, and a "leg" towards a title. The first title (CA) is granted after the dog completes three qualifying runs. Titles continue to accrue at the 10-run level and upwards beyond. Dogs who love this sport REALLY love it, and it is so much fun to just hang around a lure coursing trial and listen to the dogs waiting their turn to fly! It's almost as if they cheer for the ones going before them!! The barking and bellowing and howling while they wait their chance to shine is just fantastic. You can tell that the owners who take their dogs to these events are truly doing it for the dogs' enjoyment. It's probably my own personal favorite thing to do with a dog, and I'm hoping that some of my other dogs besides Pippin will also want to play! 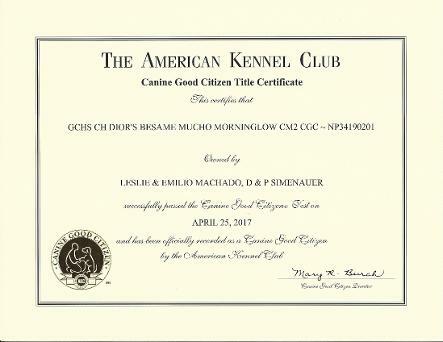 ABOVE LEFT, our Pippin (UKC CH Fluffy Acres' Morning Glow CA), on the day (2015) he won the first CA title awarded to a Coton de Tulear by the AKC. 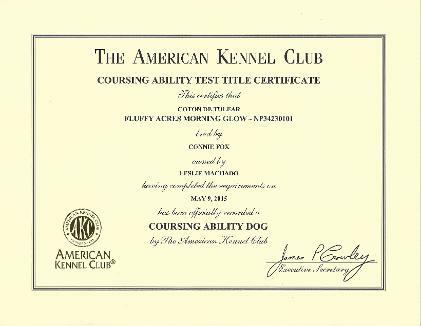 ABOVE RIGHT, a photo of his CA (Coursing Ability Dog) Title Certificate. 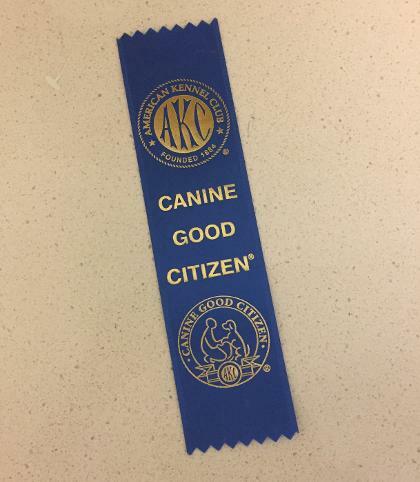 Our daughter's and son-in-law's dog ( a golden retriever) has also been awarded a CA title, and we got to watch! LEFT, and ABOVE RIGHT, Murphy (CH Morninglow's Irish Lullaby) graduates intermediate obedience class, in December 2016. BELOW, Murphy holds an extended "down stay" for the class instructor in November, 2016. BELOW, LEFT and RIGHT, Nina (GCH CH Whispering Lane's Just Right for Morninglow) participates in her beginner puppy graduation, in February, 2016. Although the graduation photo makes it looks like it was a class for white fluffies only, Nina was the only Coton de Tulear in the group!